The travel and hospitality industries continue to evolve, consolidate, and change on a daily basis. Acquisitions and mergers seem like common place, and it’s difficult to discern which property is related to which brand. The same can be said of travel demographics. The reign of dominance for baby boomers being the industry’s highest-value audience seems to be coming to an end. No, baby boomers are not going to stop traveling anytime soon, but it’s also important to have a plan for how you’re going to capture more travelers from the emerging demographic market: millennials. While the Baby Boomers (television) and Gen Xer’s (computer) came to existence during periods of great technological advancement, millennials have seemingly always been “connected”, whether this is to electronic devices or via networks of people. The Pew Research Center has defined the millennial generation as anyone that was born between 1981 and 1996 (ages 22 to 37 in 2018). The older members of this generation have been in the workforce for quite some time, and may be just entering their peak earning years. What makes this generation unique is that they’ve grown up during the age of the internet explosion, part a which plays a major role in how they digest information. Social media, constant connectivity and on-demand entertainment and communication are innovations millennials adapted to as they came of age. Why should I be focusing on Millennials? Millennials have different travel preferences then the generations that preceded them. Millennials are entering their prime earning years and are increasingly likely to travel. Let’s break each of these answers down a bit further, starting with travel preferences. Millennials use mobile, but more importantly they trust mobile. According to Google, two thirds of millennial travelers feel comfortable booking an entire trip on a smartphone. While millennials may feel comfortable booking travel on a smartphone, the buy-in (and availability to do so) is still quite limited, but that doesn’t prevent the generation from utilizing technology to book their stays. According to the New Horizons IV report from WYSE Travel Confederation, 80% of bookings made by those under-30’s (the heart of the millennial generation) in 2017 were made online, with about 20% of these coming from mobile devices. Another revealing statistic in this report is where online the young travelers are actually doing their bookings. Just under half of all reservations are being made on a 3rd party website or an OTA, and while it’s great to be filling your open rooms, doing so while paying daunting commission fees is certainly not ideal. In addition to mobile friendly users, millennials also prefer a more personalized experience, and it’s not just a preference — it’s an expectation. Part of creating a whole customer view is understanding the social aspects of these travelers. As I mentioned earlier, millennials grew up alongside social media platforms, and as such, many use the platforms to a great degree. Travelport’s 2018 U.S. Vacation Survey was one of the first indications that millennials as a category are ready to spend on travel. Over half of millennials (56%) said they were more likely to travel more this summer than last summer, a significant increase over the likelihood of their generational counterparts (Generation X – 35% | Baby Boomers – 22%) to travel in 2018. In addition to the expectation that millennials will travel more than older generations, the survey also indicated that the younger generation was more likely to spend more while on vacation (34% plan to spend $5,000+ on upcoming vacations — the most of any of the age groups surveyed according to Travelport). This idea that millennials are more willing to spend on experiences (travel) also falls into a different trend that we’ve seen within their livelihoods. According to a survey by Realty Mogul in 2017, 47% of young people between the ages of 18 and 34 would rather spend their money on traveling than buying a house, compared to only 26% percent of those ages 45 and older who said the same. This aligns with Goldman Sachs research that took a deep dive into the activities and spending habits of millennials. The % of 18-34 year olds living with their parents (typically in an effort to save money) increased 3% (from 26.9% to 29.9%) from 2005 to 2010, and that number continues to increase slightly. There are a number of things you can do to connect with more millennials (some of which I’ve touched on earlier in this blog post), but here are four concrete items you can try to incorporate into your business operations through the end of the year in order to drive more engagement with this growing younger generation. Facebook – With 61% of millennial users spending an hour a day on the platform, you’d be hard pressed to find a better outlet for sharing guest stories, images, and video in many different formats. Facebook profiles are very comprehensive allowing you to give travelers as much, or as little, information about your property as you’d like. Instagram – A picture is worth a thousand words, and by that logic Instagram lets you tell an amazing story about your property. Some new developments for IG users include setting aside a spot specifically for people to take pictures of themselves on property, and creating specific #hashtags for your business. Pinterest – Depending on the statistics you’re looking at, women account for 70-80% of decision making in travel. Knowing that, it’s important to be visible on a social media platform dominated by females. Look no further than Pinterest, which according to Business Insider is made up of 81% female users. Pinterest is a great spot to give inspiration to your travelers, and with a little practice and a few boards, you can attract quite a following. Webchat – The old way of reaching a property directly was picking up a phone and dialing. Millennials have found that they can get quicker responses by going online to accomplish the same task, and this typically is done through live chat. Live chat was initially used as a support mechanism in the hospitality industry, answering questions someone may have about their stay. Now you can actually have reservation agents help a prospect complete a booking through platforms like TRACK Chat. SMS Text Messaging – Because of their reliance on smartphones, millennials are very open to not only receiving email communication through these devices, but text messages as well. And SMS messaging can be used for a variety of reasons, from sending reservation details, stay information, and room codes to in-stay promotions and post-stay surveys. One disclaimer in using text messaging (and it’s a similar concern in social media): Don’t focus on selling. The biggest impact you can have with this channel is using it to improve the guest experience and build customer loyalty. Create a Cohesive Brand Experience – When companies make a big push towards innovation, one thing that occasionally falls by the wayside is consistency. It’s important to ensure that your brand experience is the same across your website, social media channels, and even a brand app (should you choose to really push the innovation envelope). 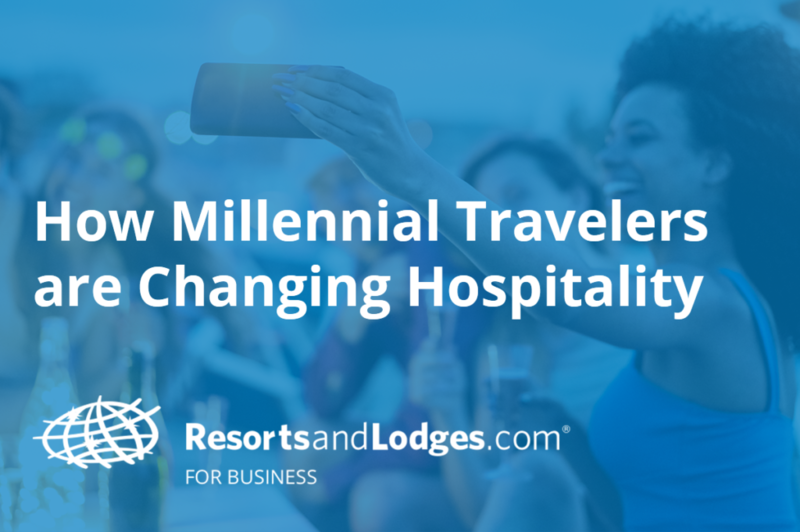 If a millennial is not seeing similar messaging across all of these channels, or feels that the experience is detached in some way, they are less likely to book their stay with your property. Pushing the envelope is important, but do so with an eye on consistency.